Psychology professor Alex Locke is an ex-convict, forced back into the criminal underworld when his daughter is threatened. After he agrees to steal a mysterious Obsidian Heart, Locke is pursued by unearthly assassins known as “The Wolves of London”. Soon he discovers the heart can enable him to travel through time but while it bestows him with his own dark powers, it also corrupts…. So, a little about the author, Mark Morris. Have you heard of him? I would like to pretend I had but the truth is I did not recognise his name when I picked this book up. I bought it purely because of two things. The first being the cover of the book looks excellent and drew me in and the second, according to the front of the book, Clive Barker thinks Mark Morris is awesome. That was more than enough for me to want to check this out. Well it turns out Mark Morris is a lot more famous than I was aware and while I did not know his name, I, and you, have probably come across his work. So Mark is an English author, born in 1963 and has been involved in, just as some examples, writing four Doctor Who novels as well as multiple Doctor Who related audio plays, he has also written a Torchwood novel and a Hellboy novel. As well as these he has novelised the video game Dead Island and the Hammer movies Vampire Circus and Noah. He has written multiple novels, some of which include Toady, Stitch, It Sustains, Fiddleback and The Black and has also written many novellas and horror collections. 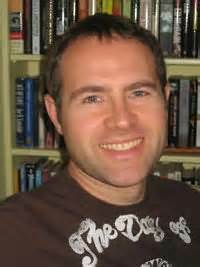 He also edited a collection of essays on the topic of “favourite horror movies of the contributors” called Cinema Macabre which was the winner of the British Fantasy Award and was nominated for both the Horror Writers Association’s Bram Stoker Award and the International Horror Writers Guild. So, now we all know who Mark Morris is, on with the story. The book starts with us meeting the main character who tells us a story about himself, Alex Locke as a young, easily led nineteen year old who lives in London far from the glitz and glamour of the main city who scrapes a living to try and get by while keeping up maintenance payments for his young daughter, Candice who was the result of a chance affair in a pub toilet. Like many people his age, he indulges in minor, petty crimes but often dreams of having more and not just scraping by. He ends up, through a connection of his friends, getting included in a job to make himself some extra cash by robbing a van carrying the takings from a local shop. As they always are, the job is meant to be simple but doesn’t go exactly to plan due to one particularly hardened criminal that takes things too far. Not much time passes before all members of the gang who committed the robbery are rounded up and imprisoned, with Alex doing time at Pentonville. Despite this rocky start, as a reader you really get the feeling that Alex is a good bloke and the story continues by giving us some evidence of that. Alex shows real determination in prison to use it as a wakeup call and become a better man for it. He uses his time behind bars wisely and earns himself a degree in psychology. When he leaves prison he puts it to good use and gets a job as an assistant in a college in East London. 16 years later and Alex is doing pretty well for himself holding down a steady job in his field, having his own apartment and another little 5 year old girl, Kate, who was born from a wife of Alex’s who we learn had a mental breakdown, suffers from visions and has tried to commit suicide leading her to be institutionalised. Unfortunately for Alex though, his past seems to catch up on him when a meeting with his older daughter Candice, who has turned into a lovely young lady turns troublesome. Candice’s partner has got himself in a little trouble and is being threatened by some tough, violent people. A lump sum of money is needed and Candice turns to her Dad for help. Alex takes the burden of her worries and says he will sort the problem but is at a genuine loss of what to do. With time running out, he very reluctantly contacts a scary character from his past by the name of Benny. To get the money, Benny sends Alex to meet another contact who is going to provide Alex with a one off job where he needs to steal an artefact, a small black obsidian heart, from the home of an eccentric, elderly man who happens to not even have any security. Clover, the contact of Benny’s who is offering the job to Alex mentions that it is being stolen for a Japanese Corporation and it doesn’t take long for Alex’s decency to win out and for him to turn the job down. He decides to move away from the criminal plans and find another way to get the money he needs but this decision starts a rollercoaster ride of twists and turns that start with the abduction of his youngest daughter Kate and an emails instructing Alex to get the heart and deliver it or see his child die. With choice now stripped away, Alex breaks into the house, takes the heart but ends up in a fight with the elderly owner that result in the owners death when the heart seems to strike out at him. Alex leaves the house with an obsidian heart that appears to change, now a murderer and with an abducted daughter but believe it or not, things could, and will, be getting much, much worse. As you would expect, the heart is not just a worthless obsidian rock but instead is a magical/demonic stone that acts almost like a parasite when connected to Alex, doing whatever it can to protect him and give him strength but while slowly draining him at the same time. Unfortunately the heart is also sought after by the Wolves of London which appear be the most surreal and horrible collection of creatures and beings ever created and as they hunt for Alex, they destroy everything and everyone he comes into contact with. The fight eventually crosses time as well as the heart’s true power starts to be realised but as Alex tries to evade The Wolves over and over again, his 5 year old daughter is still missing and for her, you fear, time is running out. I don’t really want to say much more about the story for fear of spoiling it but it is genuinely a rollercoaster ride flying from one event to another sometimes leaving you breathless and even sometimes leaving you a little confused but in a good way. Essentially it makes you focus and think a bit. The text is beautifully descriptive throughout and the characters, especially Alex and Benny, are so well developed in a very short space that you feel for them within a few short paragraphs. The whole story crosses so many genres being part crime, mystery, science fiction, fantasy, steam punk and horror that there is something for everyone and the moments of horror are plentiful and actually scary thanks to Mark Morris’ excellent descriptions. Truthfully the whole book is terrifying if, when you strip out time travel and monsters, it is essentially the great lengths a father will go to, to protect his 5 year old child who is missing and possibly dead and anyone who has a child will understand that. I really enjoyed this story and loved dark, seedy London as a back drop. Interesting and believable characters which stumble through horrifying events rather than suddenly seeming experts at them but most importantly, I adore how descriptive the author is and it allows a reader to fully immerse themselves in the story and imagine each scene clearly. Great book and I look forward to the second book in the series due out on the 16th of October, which is excellently titled The Society of Blood.